This tower in the Late Gothic style (1472 – 1476) was built as a separate belfry inspired by Italian models. After the fire of 1745 it has been modified in the Baroque style and in the 1870s it was rebuilt in Neo-Gothic cocept (architect Mocker). The clock on the tower with two cimbaloms dates back to 1577. After extensive recontruction, the tower was opened to the public in 2002. 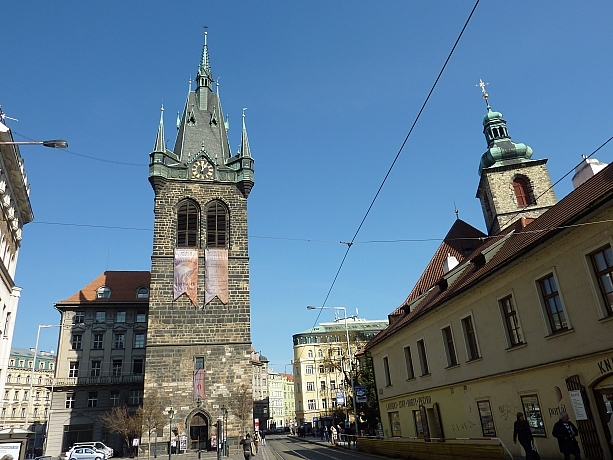 It is the highest separate belfry in Prague, 66 m high and it has ten floors. It provides a view of Prague from the corner turrets, it houses a café, a restaurant and museum of Prague items.